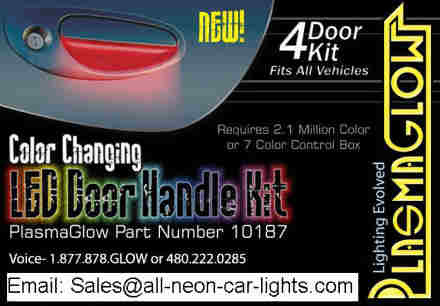 Produce Multi-Colored lighting under your door handles with the ALL-NEW Color Changing LED door Handle kit. All you need, in order to run these color changing LED Door Handle Kits, is a 2.1 Million color LED Digital control box *OR* a 2.1 Million Color changing LED Under car Kit, (which already has the 2.1M color Digital Control Box in the kit), and your ready to go! Or, you can purchase the Color changing LED Door Handle kit & a 2.1m color LED Digital Control box as a "Combo pack" and SAVE! $129.00USD On Special! Hurry! This week only.